Dimensions: Weight: 170.00 pounds Length: 76.8 inches (with headrest) Width: 24.8 inches (35.4 inches with armrests) Height: 25.5 / 31.5 inches Base footprints: 33.1 x 24.4 inches Warranty: One Year BELLAGE ELECTRIC TATTOO BED 4 MOTORS: 1 MOTOR FOR UP & DOWN 1 MOTOR FOR BACK CUSHION 1 MOTOR FOR FOOT CUSHION 1 MOTOR FOR SEAT ANGLE BELLAGE Electric Tattoo bed one of a kind design with unlimited positioning combination which will give you the ultimate freedom to perform any procedures. Ultra plush breathable fabric which is very easy to clean and maintain. Stylish hand held remote with long cord. You can also tilt the head section to maintain adequate blood flow with a push of the button. Even at the steepest angel the bed will maintain its excellent weight distribution system. 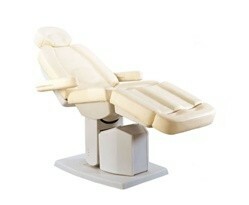 One year warranty is standard for all our equipment including this beautiful bed. Always in stock.